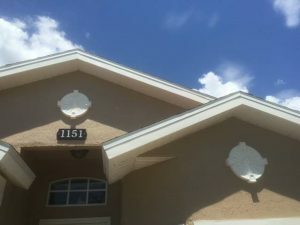 Christopher from Orlando, Florida recently completed his latest home improvement project that included one of our many decorative gable vents! Perfectly placed next to the white trimming of his home, the gable vents beautifully accompany the front of his house. The specific gable vent used in this project photo is the Round Sunburst with Moulded Trim and Keystones gable vent. Feel free to check our entire line of gable vents below!